The Raptors' most famous fan was left steaming Tuesday night after a run-in with a burly Cavalier during Toronto's 113-112 overtime playoff loss to Cleveland. Drake, the Raptors' global ambassador, exchanged words with Kendrick Perkins as the veteran centre passed by his courtside seat at halftime and after the game. The six-foot-10, 270-pound Perkins, whose nicknames include Perk and Swamp Thang, was not dressed for the contest. A heated Drake was later heard complaining as he left the arena that no one gets to speak to him like that. The Toronto rapper was chatting with former Raptor Jose Calderon at halftime when Perkins went past. The two started jawing with Cavaliers players trying to keep Perkins moving into the tunnel. In a text message to ESPN, Perkins said he told former teammate Serge Ibaka at halftime "'We about to win this game,' and Drake butted in ... So I said something back to him." The something apparently was a suggestion, perhaps colourfully delivered, that Drake sit back down. The scene was repeated after the game with Cavs players and security looking to keep Perkins moving away from Drake. The confrontation sparked plenty of social media reaction with more than a few offering up pictures or video suggestions of what might happen to Drake if the burly centre got his hands on him. The 33-year-old Perkins has played more than 900 regular-season and playoff games in the league but only one this season. The 31-year-old Drake, who probably gives up 10 inches and 100 pounds to Perkins, had been animated throughout the game, standing up at one point to urge the fans to get involved. He also was seen smiling as he had a chat with LeBron James at another point. 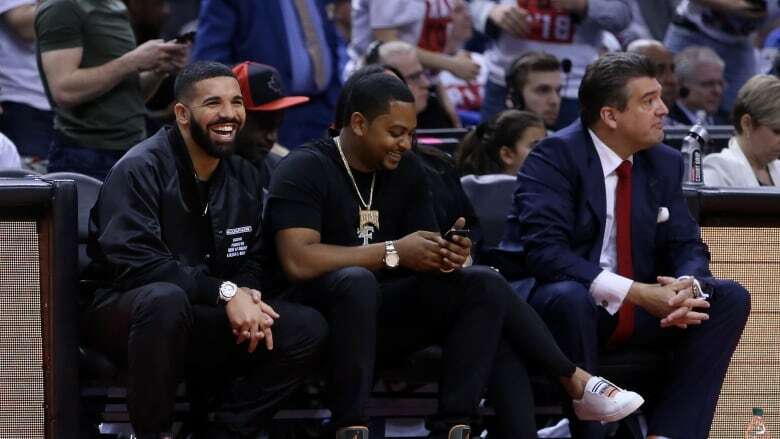 The Toronto rapper is hard to miss when he attends games. His seats are front and centre just next to the Raptors bench. Home and visiting players often pay a visit, but usually with a lot more decorum. Emotions had run high throughout Tuesday's game, with few niceties observed. Late in the game the soldout Air Canada Centre crowd of 19,954 chanted "Khloe! Khloe!" as Canadian Tristan Thompson went to the free throw line for Cleveland — a pointed reference to girlfriend Khloe Kardashian, who recently gave birth to the couple's daughter, amidst a mountain of tabloid fodder about the couple. An unfazed Thompson made both free throws. Earlier Raptors star DeMar DeRozan took an elbow to the head, trying to pry a rebound out of the hands of Cavaliers forward Kevin Love. That prompted an Instagram post from his partner, complete with a shot of the section of league rule book that deals with flagrant fouls. James flexed his muscles in front of the Raptors after getting the better of Raptors defender OG Anunoby and slamming down a ball inbounded from under the Toronto basket. James also threw himself into the seats trying to corral a loose ball.